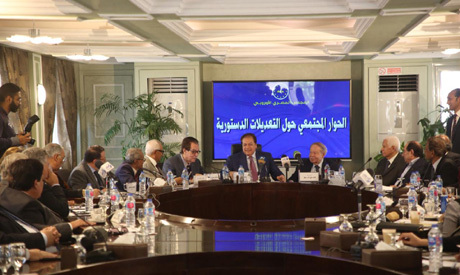 The Egyptian European Business Council held a gathering on Wednesday to announce their support for proposed amendments to Egypt's constitution which would allow President Abdel-Fattah El-Sisi to run for two more terms after his current term expires in 2022. The parliament approved the changes in a preliminary vote last month, although it must hold a second vote before they are put to a national referendum. The changes, initiated by pro-government parliamentary bloc Support Egypt, have ignited controversy. Those who back the changes say they are important for the stability of a country hit by years of political turmoil since the 2011 revolution, and to allow the president more time to carry out his economic development plans. Opponents say the changes consolidate authoritarian rule. The amendments include extending the presidential term from four to six years in Article 140 of the constitution, and adding a transitional clause that allows the current president to run for two more six-year terms after his current and second term ends in 2022. The changes would allow any other president to run for two terms only. The proposals also includes setting up a second house of parliament, the Council of Senators; under the changes proposed, the president would appoint one-third of its members. The changes were preliminarily approved in February by 485 MPs in the 596-seat assembly, more than the two-thirds majority required to pass amendments to the national charter. The left-leaning 25-30 parliamentary bloc, which comprises of 16 MPs, opposed the changes, which it said "undermine the principle of the transfer of power." Thousands of others, including prominent lawyers, judges, actors, as well as ordinary Egyptians, have signed a petition against the changes, which has been circulating on social media. The parliament begun a series of national dialogue meetings over the amendments on Wednesday, expected to last for two weeks. The first of six scheduled hearings for the parliament's national dialogue over the proposals was held earlier on Wednesday, with dozens of university professors, Al-Azhar and the Coptic Orthodox Church clerics, as well as representatives from state-run-media and public and private TV and radio channels in attendance.